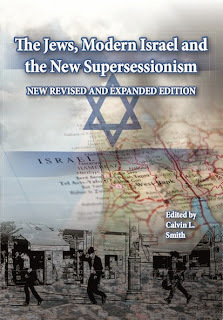 Having watched Calvin Smith debate so effectively on TV with fierce opponent of Christian Zionism, Stephen Sizer, a couple of years ago, I awaited this series of essays ‘The Jews, Modern Israel and the new Supercessionism’ with some impatience. With his choice of essayists Smith certainly succeeds in ‘challenging disingenuous efforts by … supercessionist commentators aimed at portraying all (Zionist) Christians …….. as a somehow narrow, peripheral and fanatical segment of the church.’ Written by such varied authors as Calvinist Stephen Vantassel and Charismatic Steve Malz, the range of Zionist Christians can scarcely be described as narrow. Read the rest of Fran Waddams' review over at Anglican Friends of Israel.